Botanical Name: 1. Inula britannica L.; 2. Inula japonica Thunb. Part Used & Method for Pharmaceutical Preparations: The flower is gathered in summer and autumn, when it is blooming, and is dried in the sun. Properties & Taste: Bitter, pungent, salty and slightly warm. Meridians: Lung, spleen, stomach and large intestine. Functions: 1. To resolve phlegm and promote water metabolism; 2. To conduct qi downward and stop vomiting. 1. Phlegm fluid blocking the lungs manifested as asthma and cough with profuse sputum. Inula flower (Xuanfuhua) is used with Pinellia tuber (Banxia) and Asarum herb (Xixin). 2. Phlegm fluid blocking the stomach leading to rebellious qi manifested as eructation, vomiting and epigastric full sensation. 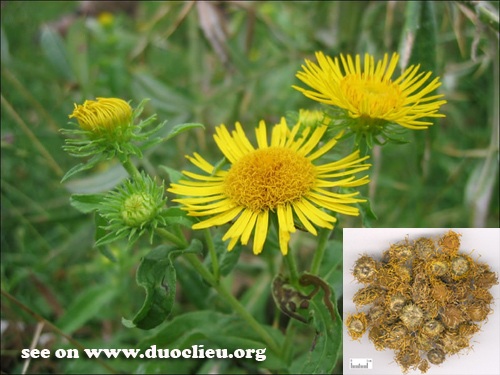 Inula flower (Xuanfuhua) is used with Red ochre (Daizheshi), in the formula Xuanfu Daizhe Tang. 3. For epigastric fullness, vomiting, and eructation due to Deficient Spleen Qi and Stomach Qi and stagnant Phlegm Dampness, it is used with Rhizoma Pinelliae (Ban Xia), Rhizoma Zingiberis Recens (Sheng Jiang), and Radix Ginseng (Ren Shen). Dosage: 3-10 g, wrapped in a piece of cloth and decocted in water for an oral dose. Cautions & Contraindications: When decocting this herb should be wrapped in cloth.